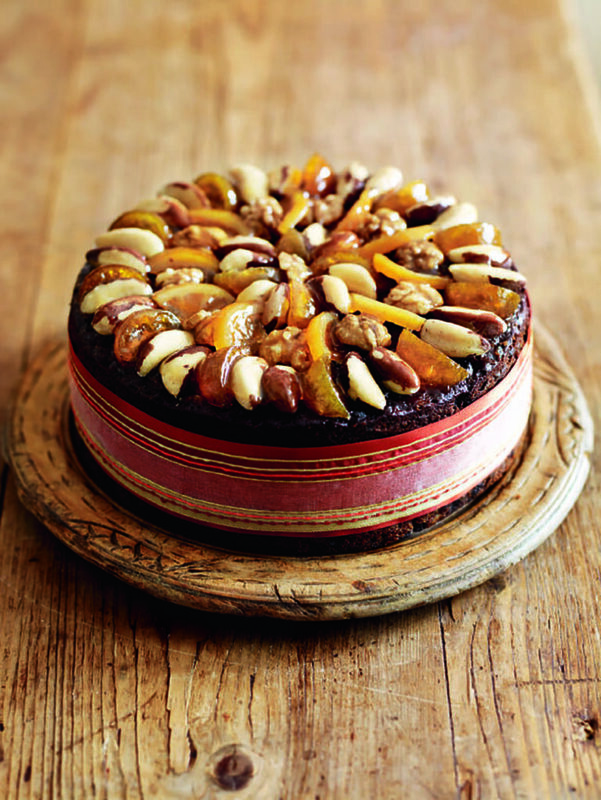 Cooking this Christmas cake recipe early allows you to give it a few more doses of Drambuie. Put the glacé cherries, dried fruit and candied peel in a large pan, then add the Drambuie, zest and juice. Bring to the boil, stirring, then cover and simmer for 5 minutes. Tip into a bowl, cover and leave overnight. The next day, preheat the oven to 140°C/fan120°C/gas 1. Grease and line a deep 23cm heavy-gauge cake tin with baking paper, then grease the paper. Tie a thick, wide strip of folded newspaper around the outside of the tin, put more folded newspaper on a baking tray and put the cake tin on top. This stops the outside cooking too quickly. Fold in the rest of the flour, the soaked fruits and any remaining liquid, the walnuts, treacle and marmalade. Spoon the mixture into the prepared tin and level the top. Make deep indentations all over the surface of the cake mixture using the handle of a wooden spoon. This will help to keep the top flat. Take a large sheet of baking paper and fold in half – it should still generously cover the top of the tin. Cut a 2cm hole in the centre. Put the paper on top of the cake tin, slide onto a low oven shelf and bake for 4-4½ hours, or until a skewer inserted into the middle comes out clean. Take the cake out of the oven and let it cool completely in the tin. Remove the cake from the tin, then peel off the baking paper. Wrap in clean baking paper and foil, then store in a cool dark place. Next day, unwrap and spike the base of the cake all over with a skewer. Drizzle over 1 tbsp Drambuie, then re-wrap. Repeat once a week until you’re ready to decorate the cake. To decorate the cake, warm the no-peel marmalade in a small pan. Put the cake on a board or serving plate. Brush a little of the warm marmalade over the top, decorate with the candied fruits and nuts, then brush with the remaining marmalade. Store in an airtight tin. but they are available online from countryproducts.co.uk.